I suppose it is safe to say that one of my favourite flavour combinations is apples and caramel. I found this recipe while watching The Chew, my new daytime television obsession. Daily at 1:00 pm join chefs Michael Symon, Carla Hall, Mario Batali, fashion guru Clinton Kelly, and author, health advocate, and Dr. Oz’s daughter Daphne Oz as they tackle the art of cooking, chatting, and of course eating! On numerous occasions when I ask my mom what is for dinner, she replies “Oh just this recipe I saw on The Chew!” That is all the answer I need in order to know that it is going to be absolutely delicious. 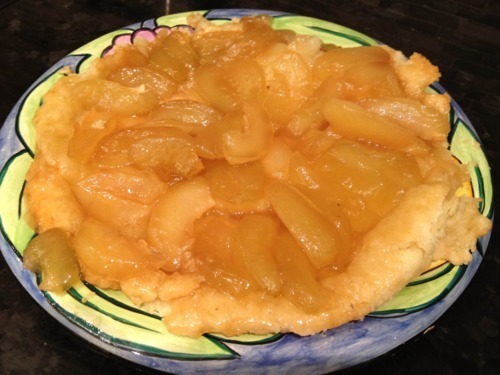 As for todays recipe, after watching Carla Hall bake this Tarte Tatin, I figured I would take a stab at it. It seemed pretty easy and tasty. The recipe calls for store bought pie dough, but I decided to make my own and take full credit for the dessert. *As you can see, the pictures are not perfect, and either is the pie, but regardless, it tasted delicious! 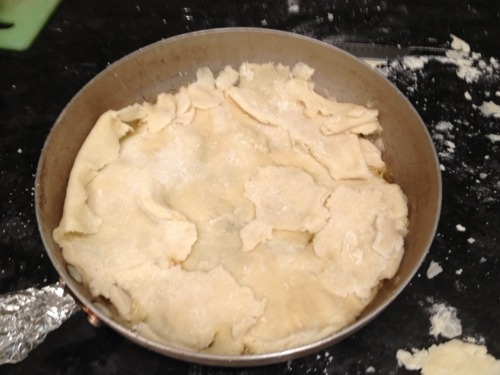 After making the pie crust, you must allow it to chill in the fridge for anywhere from 1 hour-2 days. I let mine sit overnight. 1 Combine flour, salt, and sugar in a food processor; pulse to mix. Add butter and pulse 6 to 8 times, until mixture resembles coarse meal, with pea size pieces of butter. Add ice water 1 Tbsp at a time, pulsing until mixture just begins to clump together. If you pinch some of the crumbly dough and it holds together, it’s ready. If the dough doesn’t hold together, add a little more water and pulse again. Note that too much water will make the crust tough. 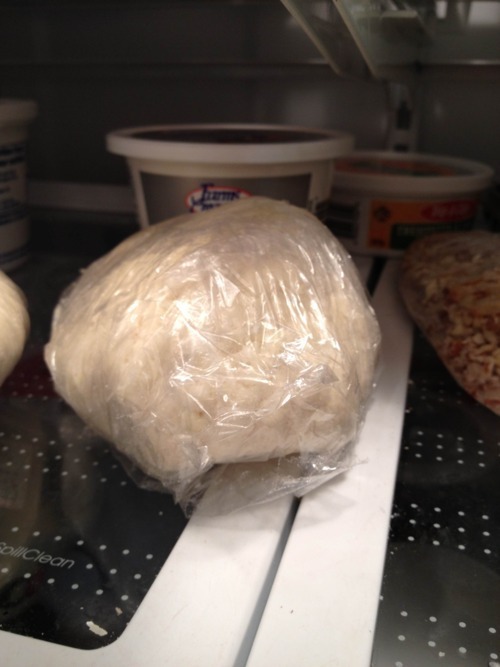 2 Remove dough from machine and place in a mound on a clean surface. Gently shape the dough mixture into two disks. Work the dough just enough to form the disks, do not over-knead. You should be able to see little bits of butter in the dough. 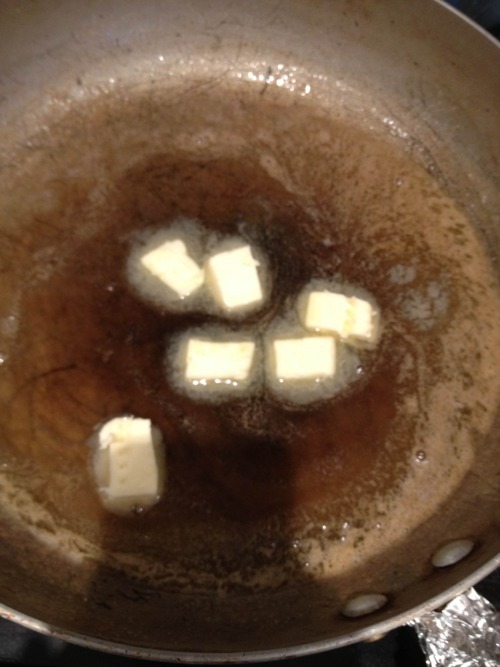 These small chunks of butter are what will allow the resulting crust to be flaky. Sprinkle a little flour around the disks. Wrap each disk in plastic wrap and refrigerate at least 1 hour, and up to 2 days. 3 Remove one crust disk from the refrigerator. Let sit at room temperature for 5-10 minutes in order to soften just enough to make rolling out a bit easier. 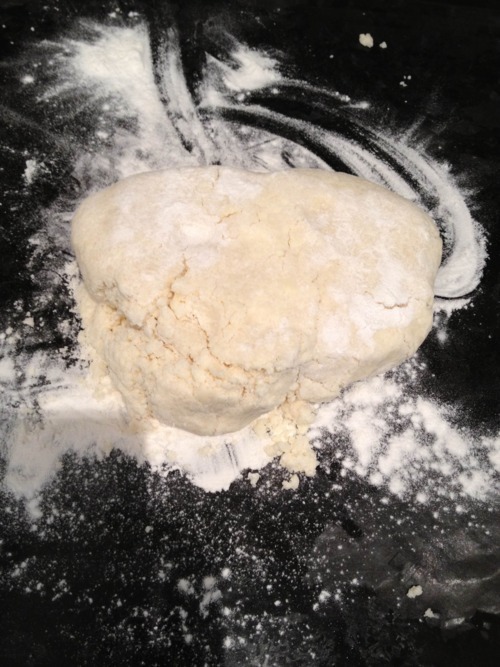 Roll out with a rolling pin on a lightly floured surface to a 12-inch circle; about 1/8 of an inch thick. 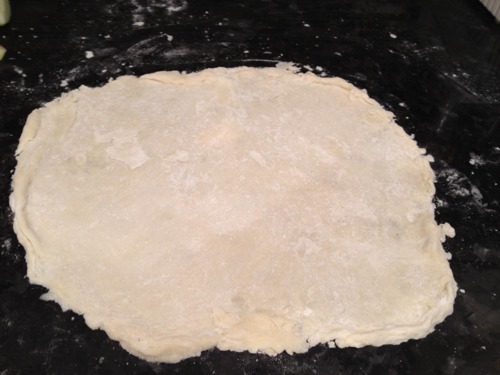 As you roll out the dough, check if the dough is sticking to the surface below. 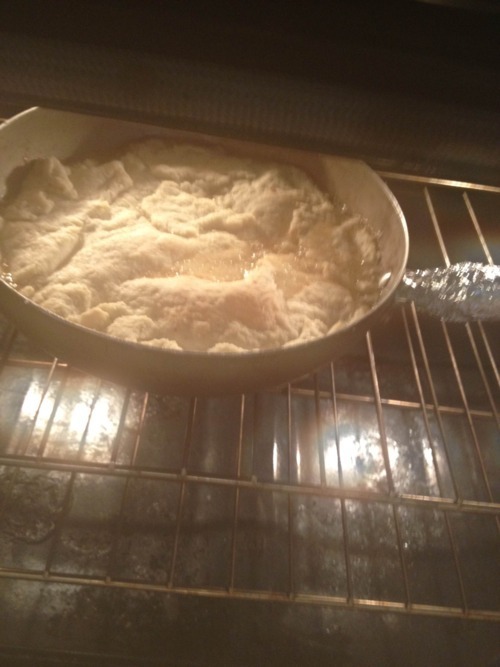 If necessary, add a few sprinkles of flour under the dough to keep the dough from sticking. 2. In a 10-in cast iron skillet, combine the sugar, apple cider, lemon juice, and seeds from the vanilla bean pod over high heat. Bring to a boil, and use a damp pastry brush to brush down sides if necessary. After about 6 to 7 minutes it will become a light brown color. 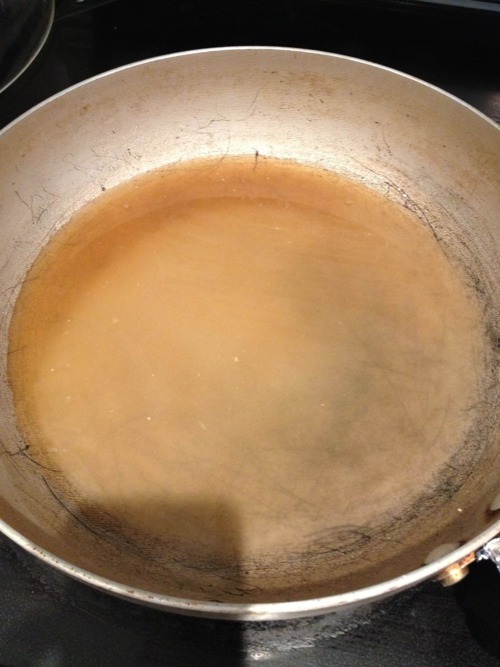 Stir gently to promote even cooking, and allow it too cook until it becomes a deeper amber color. 3. Remove the pan from the heat, and add the butter, two tablespoons at a time, stirring in to incorporate as the mixture bubbles. When it has all been incorporated, stir in the salt to incorporate. 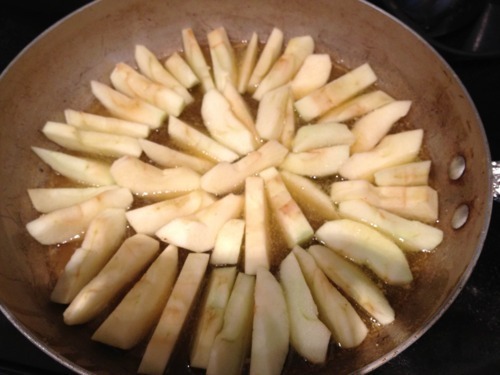 Arrange the apple pieces, rounded side down in the pan. Return the pan to the heat and cook over medium for another 20 minutes. Remove from heat. 4. 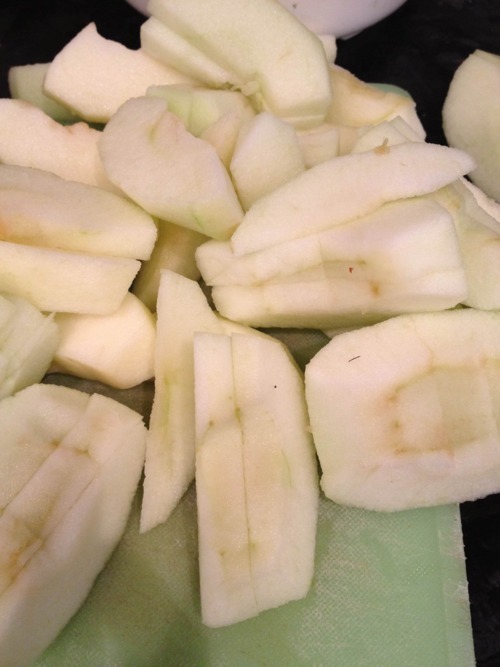 Roll out the pie dough and place over the top of the apples, cutting to size with a paring knife and tucking in the edges. Bake until the crust is golden brown, about 20 to 25 minutes. Allow to cool for about 20 minutes, and then place a platter over the crust and carefully flip it over, allowing the tart to gently fall from the pan. 5. Serve the tart with dollops of mascarpone (Optional, I chose to omit this step).